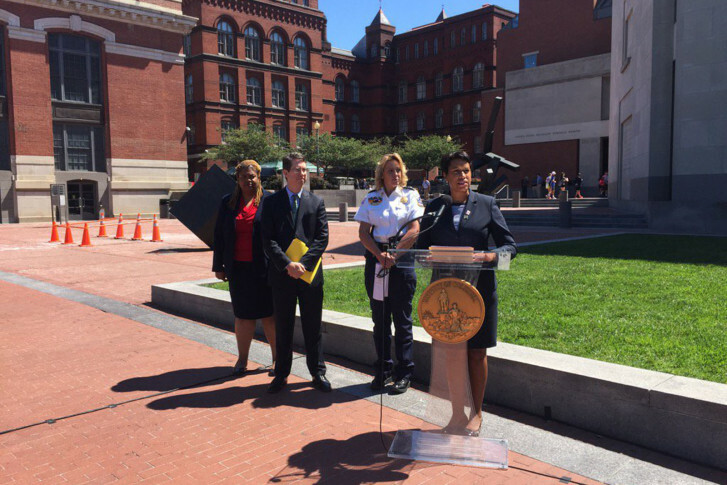 WASHINGTON — D.C. Mayor Muriel Bowser announced proposed regulations Thursday that would require special police officers be trained in areas including the proper use of force, conflict de-escalation, dealing with the mentally ill and active shooter situations. The deaths of two individuals while in the custody of special police officers have led to a push to change the regulations that govern those officers. They can be hired by companies or individuals to protect a specific location. They have arrest powers at that location and also can be authorized to carry a gun. Last year, a 74-year-old patient of MedStar Washington Hospital Center died after an altercation with two officers, and a 27-year-old man died after being taken into custody by guards at an apartment complex in Southeast D.C. The two officers involved in the hospital incident have pleaded not guilty to involuntary manslaughter charges and have been removed from their jobs. “We all came together to review our current requirements and regulations, and all of the rules around people who have arrest authority in Washington, D.C.,” Bowser said, following the deaths. The new proposal includes more firearms training, bringing the requirements for special police officers in line with what is required of officers in the District’s police department. However, Bowser also said special police officers play a crucial role in keeping the city safe. “We are grateful for their service, and we need them,” she added. Bowser made the announcement outside the Holocaust Museum, where a special police officer was killed by a gunman in 2009. The gunman was then subdued by two other special police officers. There are about 7,700 special police officers in the District, and about 4,500 of them are armed, according to Office of the Deputy Mayor for Public Safety and Justice. A public comment period on the regulations is expected to begin in the coming weeks, and the proposal will likely be reviewed by the D.C. Council in the fall.